Northern Forest Archipelago is a Micro-Nation with constitutional monarchy centered in and around Saranac Lake/Lake Clear, New York. 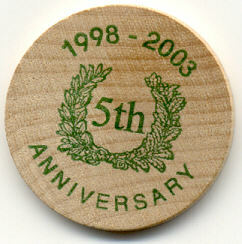 This coin is made of wood, issued on 01st September 2003. Only 250 of these coins have been produced to commemorate the fifth anniversary of the founding of Northern Forest Archipelago. 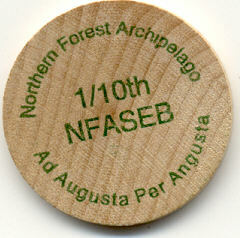 The coin is 1.5 inches across, and made from various hardwoods available here in the NFA. Non-toxic green ink is used in printing the wordings on it. Ad Augusta Per Angusta, means "to high places by narrow paths". One NFA Sweat Equity Buck (NFASEB) is equivalent to a US $10 Bill. Pictured above you will find pictures of the first Northern Forest Archipelago Metal Coinage ever issued. There were 250 of the bronze coins minted, 100 of the black nickel, 25 of the silver, and 25 of the gold. The coins are 1.5" in diameter. 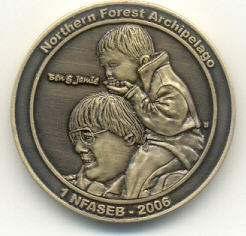 The front has a picture of (Ben & Jemie) King James and the Crown Prince Benjamin, coin information arcing across top and bottom, and a "B" for Backwoods (the capital of the NFA). 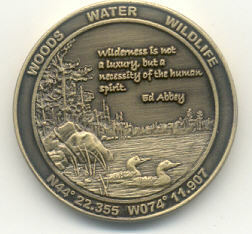 The back has a picture of a natural setting common to the NFA, a quote from Ed Abbey (Edward Paul Abbey, 1927-1989) about the nature of wilderness, "Woods Water Wildlife" across the top, and the GPS coordinates coordinates of Backwoods. http://northern-forest-archipelago.org/coin.html. and for recent issues at: http://northern-forest-archipelago.org/bux.html.